Let Orchard Breezin’ whisk you away! Perfectly balanced and not too sweet, Orchard Breezin’ is the perfect beer and wine cooler alternative. 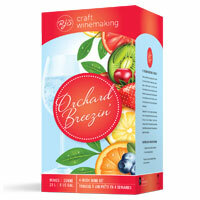 Ready to drink in only four weeks, Orchard Breezin’ wines can be enjoyed chilled on their own or mixed with juices, sodas, and liqueurs to create crowd pleasing cocktails. Wine lovers have been discovering the joys of making their own craft wine with RJS Craft Winemaking since 1962. RJS Craft Winemaking makes over 120 award-winning wine kits using juice and concentrates from grapes sourced throughout the world's leading wine regions. The result is superior tasting wines you will savour and be proud to share with your family and friends.